Whether for dinner parties or festive occasions, gatherings happen more around the dining table than in the living hall. With guests pouring time and again, you want to make sure they are comfortable and aren’t fatigued while sitting through those long driven conversations. 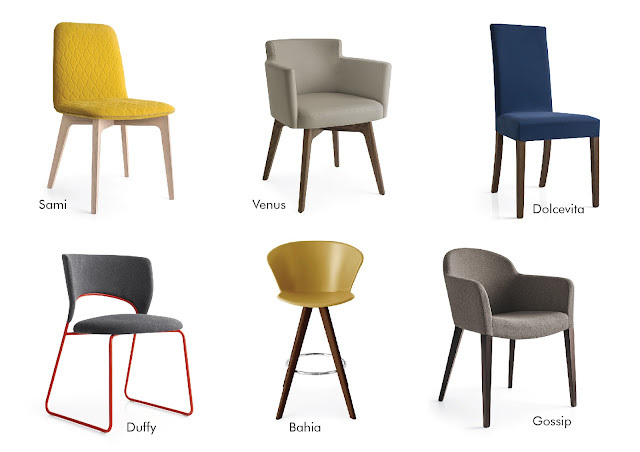 Be it classic or contemporary, high back or low back, upholstered or plain, armchair or armless, here are 20 dining chair styles to pick from, for those every day repast or soirées. Sami: This upholstered chair by Calligaris is a fun and modern alternative to the typical chair. It is characterised by a hexagonal pattern, contrasting cross-stitches along the edges, and supported by a solid wood base. The fresh design of the chair is one that cannot be matched. Whether placed in the dining room, the kitchen, or anywhere else in your home, the chair will enhance any situation through its bold and stylish design. Venus: This leather chair by Calligaris is the perfect comfort option for a dining chair. With back and arm support, the Venus chair offers utmost support and comfort while its contemporary style ensures it will be the ideal fit for your space. The base of the Venus has a 180° swiveling base featuring a re-positioning mechanism. The base also comes in a couple of solid wood finishes and a new lacquered finish while the seat is available in a choice of two fabric colours. Dolcevita: This royal blue high backrest chair by Calligaris gives you full lumbar support while dining. The classic design chair has a base made of solid wood and the upholstered seat and backrest is covered with removable fabrics. The fabrics can withstand stain and has a anti-bacterial treatment. Duffy: This stylish and sleek upholstered chair by Calligaris has a sled base and an upholstered seat and backrest. The base allows this chair to be both lightweight and sturdy. It balances style, comfort, and has an aesthetic value. Bahia W: A comfortable, cosy and colourful stool by Calligaris. This chair is bio-inspired and its shape is reminiscent of large tropical flower petals. Bahia's wraparound backrest and ergonomic design makes it extremely comfortable. Its polypropylene shell is flexible and strong, hard-wearing and recyclable. It has a wooden base with four tapered legs and coloured metal crossbar. Gossip: This comfortable upholstered armchair is designed to work in both living and dining areas. This Calligaris chair is covered in stain-resistant and antibacterial fabric. Thanks to the correct height of the armrests, it can be placed at the dining table or desk. Loto W: Thanks to its light and delicate silhouette, this Bonaldo chair is suitable for any setting. It has a plastic monocoque body in colours such as: transparent, smoke, green, plain white or plain black. The legs are in solid ash wood and are available in three different finishes. It is also available with a matching stool. Ivana: The stylish high back chair by Bonaldo has refined stitching on the backrest which is similar to those on a chesterfield sofa. It has a steel frame and shrink-resistant rubber padding which enhances the comfort of the seat. Its features make it suitable to formal settings. The legs are chromed or painted: glossy white, glossy black or matt anthracite grey; the upholstery is available in fabric, eco-leather or leather. 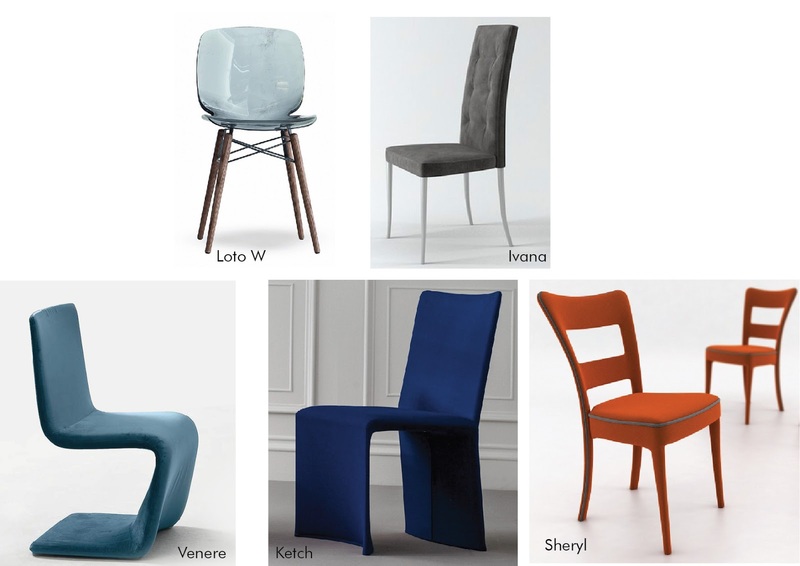 Venere: A single, continuous line shaped upholstered chair is made particularly comfortable with its sinuous form. This chair can dominate a scene or coexist elegantly alongside other furniture. The Venere lounge relaxing Bonaldo chair has a steel frame and cold-foamed polyurethane padding. The upholstery choices are available in removable fabric cover, skay (eco-leather) and leather. Ketch: This Bonaldo dining chair draws its inspiration from the world of sailing, both in its name and in design. A Ketch is a type of sailing craft, recalling the shape the sail takes when filled with wind: these shapes are at the same time curved, taut and seamless. The metal frame and comfortable padding are upholstered with leather, eco-leather or fabric covers, which are fully removable. Sheryl: Classic with the contemporary twist, this chair bestows an enchanted atmosphere onto any setting. Thanks to its sinuous and light-weight shape, it is not only suitable for dining but use in bedroom too. The continuity between the backrest and the rear legs, comprising a soft slightly curved line, creates a harmonious feel to which the chair adds depth. Sheryl has a solid wood frame and the upholstery choices are fabric, leather or eco-leather covers. Made by Bonaldo, it stands out for its ornamental border, contrasting or matching colour. Norma: This Tonin Casa refined and classic chair is suitable for dining or living rooms. It is available in different finishes, materials and colours. Mivida: This exceptionally comfortable dining chair is designed keeping in mind the details, quality and experience. This handmade chair exudes artisan craftsmanship with its excellent tailoring skills. This chair by Tonin Casa is made in cold foamed polyurethane, with wooden structure that is available in different finishes and covered upholstery to suit your style - leather, full grain leather, nabuk leather or eco-leather. Adria: This dining chair by Tonin Casa exhibits grace and charm from the top down. It offers extreme comfort and class which don’t go unnoticed. This side chair comes with a distinct seat pad and back pad, extending the comfort for longer evenings around the dinner table. The base and Upholstery options are available in a number of choices, the upholstery options include leather, eco-leather, grain leather or nabuk leather. 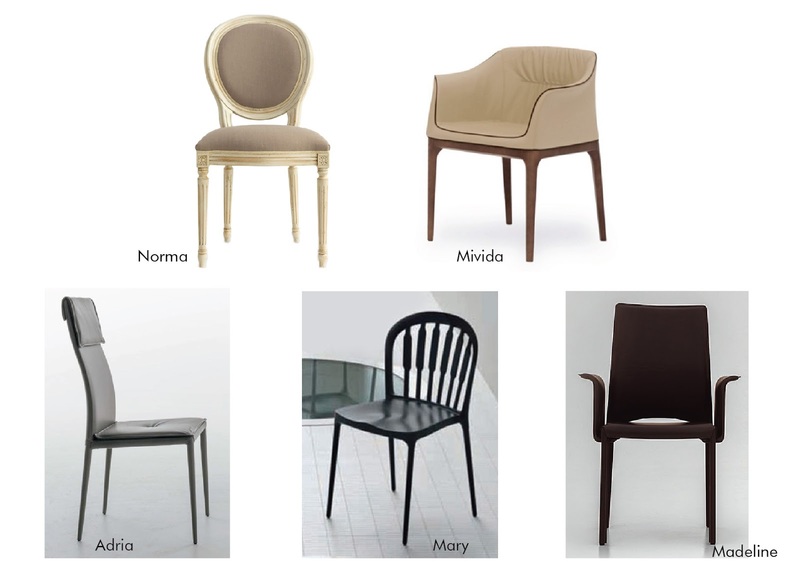 Mary: This dining chair is a vintage design, formed from truly modern materials. It features six spokes on the backrest, moulded in rigid polyurethane available in different colours and slight splayed legs are elegant and supportive. A new timeless classic, this Tonin Casa chair exudes a young attitude and fine Italian workmanship, which will last for many generations to come. Madeline: This high back chair by Tonin Casa makes the perfect set around your dining table. Its simplicity and comfort are those of a chair which is unique and timeless. It has a metal structure entirely covered in real thick leather. It is also available in armrest or with a larger seat version. Monte Carlo: This Alf contemporary and elegant dining chair has its seat and back upholstered in grey fabric, with contrasting piping and button detailing. The legs are lacquered in Grey "Kotò" High Gloss wood. It reflects light to brighten any dining room and is enhanced through the chrome profiles and elegant lines. Pisa: Bold and beautiful Alf Italia chair is available as armless or as a arm chair. The high back chair makes it elevating. Caruso: The chairs by Alf Italia in their classic taste are enhanced by delicate inlays that make any setting unique. Made out of solid wood, the chair has its seat in upholstery fabric. Accademia: This Alf Italia dining chair not only goes well with its set but also goes well with bold contemporary designs. It offers an elegant, stylish shape. It features upholstered seat and curved back with a wooden top. It stands on wooden tapered legs. Eva: This dining chair is part of a collection of Italian dining room furniture that is stylish and will bring a touch of class to your space. Eva features mink birch veneer with a high gloss finish with an eco-leather high back and seat, giving it a beautiful contemporary look and feel. This Alf Italia chair has matching case pieces available for a complete Italian look in your living space. 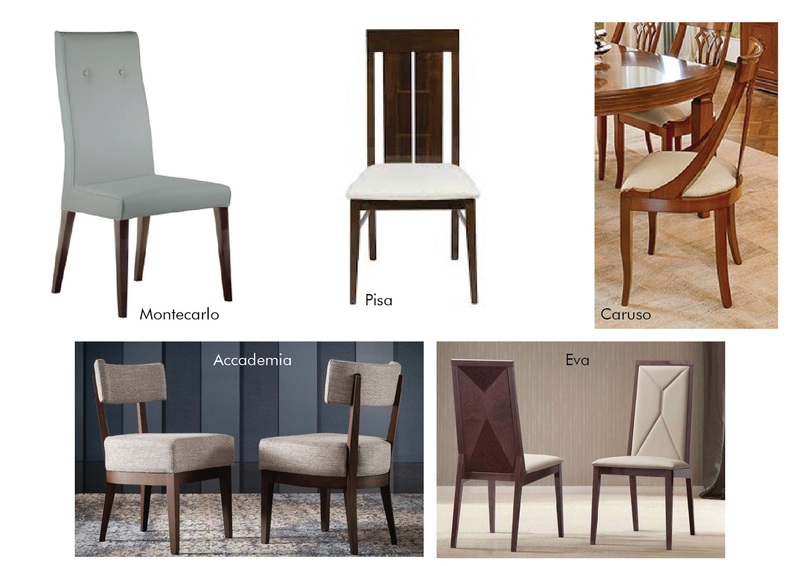 Explore our dining chair collection here.